One of Sir Winston Churchill’s favourite spots in the garden of his residence at Chartwell - the place believed to be most closely linked with the iconic politician’s development as a painter - was the goldfish pool. Depicted here in deep hues of red, brown, green, orange and yellow, his beloved pool occupies a canvas that has appeared on the market for the first time since he gifted it to his bodyguard, Sergeant Edmund Murray. Unlike his various other landscapes at Chartwell, which tend to focus on a wide panorama of the stunning gardens, this work zooms into the water of the pool and the luscious foliage around it. 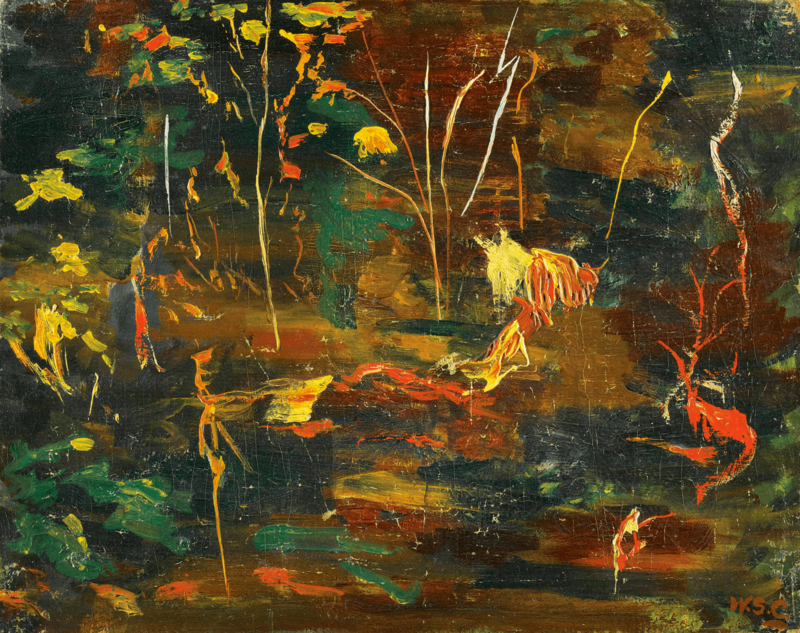 More than simply capturing a corner of the water body, however, the painting is a study in tonality, combining multiple hues to striking effect, bringing the subject to life with strokes of orange impasto that seem to verge on the abstract. The same subject finds expression in a Churchill masterpiece from 1932, formerly in the collection of his daughter, Mary, and sold at a Sotheby’s auction for a world auction record of £1,762,500.